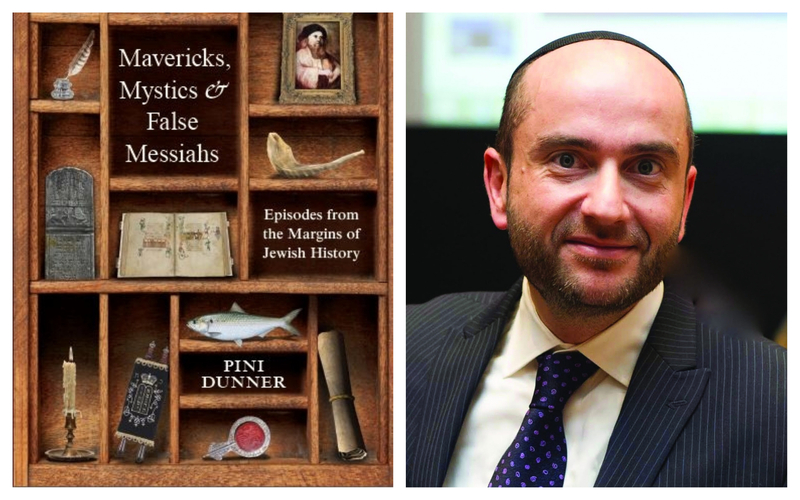 My friend Rabbi Pini Dunner recently published a fascinating book, Mavericks, Mystics & False Messiahs. This slim and mesmerizing volume discusses a variety of colorful episodes from Jewish history. Some of them are well-known stories of considerable significance, such as Shabbtai Zvi, and the fight between Rav Yaakov Emden and Rav Yonasan Eybeschutz. Others are lesser-known stories of mavericks, such as Samuel Falk and Lord George Gordon. The book is not intended as an academic work, but rather as a popularization of accounts that are usually only known by history buffs. The Shabbtai Tzvi story is astounding. Among his bizarre escapades was dressing up a fish as a baby, celebrating all the chagim in a single week, innovating a blessing to be pronounced upon committing a sin (Baruch matir assurim), and eating pork in public, after reciting that blessing! How on earth did he bring so many people under his spell? Particular astonishing is the account of how Rabbi Chaim Beneviste, one of the outstanding halachists of his era, was initially skeptical of Shabbtai Tzvi, had a fierce confrontation with him, and then was converted to being a staunch believer! I recall about twenty years ago asking my Rosh Yeshivah how to understand the Emden-Eybeshutz controversy. He was clearly uncomfortable with the question. After all, either Rav Yaakov Emden was badly wrong, or Rav Yonasan Eybeshutz was an apikores! The latter was the more unpalatable option, and so it had to be Rav Emden who was wrong. But, my Rosh Yeshivah claimed in his defense, this happened because when a very important power of holiness arises, such as Rav Eybeschutz, then the Satan is given extra-strong powers to counter it, which is how the Satan managed to lead Rav Yaakov Emden astray in his campaign. Rabbi Dunner's conclusion in the Emden-Eybeschutz controversy is that Rav Eybeschutz might indeed have been a Sabbatean, but it cannot be conclusively determined either way. (But see Prof. Shnayer Leiman's article here.) Yet, as Rabbi Dunner points out, it is no longer relevant today, since both of them are now renowned for their contributions to Torah literature. This is very similar to the verdict reached at the time by Rav Yechezkel Landau, who was largely convinced that Rav Eybeschutz was indeed a secret Sabbatean, but basically said that it didn't matter, because it was secret! 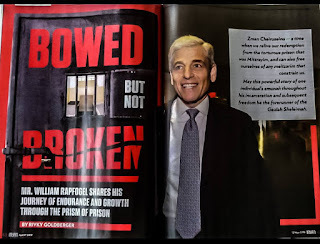 Given the discomfort with these topics in the yeshiva world, I was intrigued to see that Rabbi Dunner and his book were the feature story in a recent issue of Mishpacha magazine. How would Mishpachah cover these disturbing controversies? Perhaps wisely, they didn't; there was just a passing reference to their existence. But Mishpacha doubtless gave a tremendous boost to Rabbi Dunner and his book. Hopefully there will be no negative consequences to giving him a high profile in the charedi world, and it won't lead to any unwanted attention from zealots. 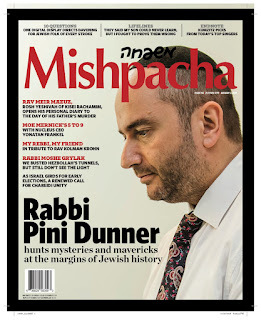 As the late Rabbi Nissan Wolpin said to me thirteen years ago, "As soon as I saw you on the cover of Mishpacha magazine, I knew they'd come after you!" "The topic of Shabbtai Tzvi, and even more so the Emden-Eybeshutz controversy, are generally not considered suitable topics for discussion in the charedi world." I am curious if a single reader on this blog that was raised in the American charedi word would agree with this. I certainly heard plenty about both of these controversies in the charedi yeshivas I attended. I am quite skeptical that the average MO american kid would know more than the average charedi kid on these topics. Agree. Rav Berel Wein's history book covers this it in depth, and that book is common in chareidi households. Others cover it as well. With all due respect, you seem to be living in some alternate reality. Those topics are widely discussed in the Chareidi world. Evidently we had very different experiences. Evidently, you project your own personal experiences on the entirety of the Chareidi world. I am (proudly) deeply entrenched in the chareidi world and in my experience, I'm with Milton and Levi Yitzchok. Anyone besides Rabbi Slifkin who grew up chareidi and ever heard of these topics not to be suitable? Rabbi Berel Wein, in the introduction to the Eybeschutz Haggadah: "Traditional Jewry has always sided with Rabbi Yehonatan and accepted his denials of all the charges made against him. Only in the rarified atmosphere of Judaic academia does the dispute still rage in our time." The quote from Rabbi Wein supports my point and refutes yours. Assuming Rabbi Wein uses "traditional" to mean "charedi" (if he doesn't then his quote is irrelevant), then the argument is discussed in charedi circles. You may disagree with the charedi/traditional conclusion but your post said that charedim do not consider the argument "suitable for discussion." That is simply untrue in the American charedi world. "Rabbi Berel Wein, in the introduction to the Eybeschutz Haggadah: "Traditional Jewry has always sided with Rabbi Yehonatan and accepted his denials of all the charges made against him. Only in the rarified atmosphere of Judaic academia does the dispute still rage in our time."" Wow, that's a terrible response. None of that in any way indicates that the topic is "not considered suitable topics for discussion in the charedi world"
You're trying to show that R' Berel Wein also makes clear that chareidim discuss these topics and always have? Of course the dispute is not raging any more. On that we agree. I think that you guys are working on two different definitions of "discuss". Everyone knows that they had this dispute. Saying that Rav Eybeschutz was actually as secret Sabbatean is a different matter. Lots of things are "discussed" in the Chareidi world if you define discussion right. For example, abuse is "discussed" (don't report it to the authorities). That's quite a pathetic defense. Even for a lackey. I agree with RNS, only he seems to think that these topics "are not generally considered suitable topics for discussion" is a bad thing. What is wrong with that, pray tell? Neither of these topics have ever been "suppressed" in traditional circles, its just that there's also no reason to specifically make a point of teaching them to everyone. The curious and the intelligent (which include a lot more charedim than RNS seems to stereotype) quite easily learn about them, and are quite well informed. It's a matter of tact and Shikul Hadaas, both qualities that (at least on the internet) are in shorter and shorter supply. My experience is like Milton's & Levi Yitzchok's. Unless we were fed a sanitized version. What's everyone else's experience? Everyone else is the same as yours. RDNS fell in his head. Or took a bad blow to the ego. I wasn't looking for an individual to quote everyone, but thanks anyway. Of course you heard in yeshiva of the controversy and of the rabbis involved, but I doubt that this extended to an understanding of the specific sabbatean beliefs and practices involved and their relation both to medieval Jewish folk ritual as well as modern maskilic philosophy (which Scholem pointed out). Such discussions depend upon a historical / historiographical consciousness that is largely absent from chareidi discourse, as Reb Natan suggested. "that is largely absent from chareidi discourse, as Reb Natan suggested." You are simply incorrect about that, as everyone else here suggested. Pet peeve here. shouuld be mattir issurim not assurim. Also, I did not see this book but, I once was researching the Eibeshitz Emden debate and came across a few t things. 1. In Megilat Sefer, R Emden says that he met with R Eibeshits who offered to make everyone buy his siddur if he stopped speaking out against him. R Emden wrote that he turned him down bec he felt it wasn't fair to force a whole city to buy his siddur. 2. In Maagal Chaim, Chida's diary. Chida relates that the Pnei Yehshua was on R Emdens side (18 Av 5514). 3. The story of R Chaim Benviniste is very fascinating. It is hard to overestimate his influence in Halacha. He is arguably the most influential Sephardic Posek of the Acharonim after R Yosef Karo - his Kensset Hagedola. 4. Lastly, I went to Charedi Yeshivas and the R Yaakov Emden and R Yonasan Eibeshitz pulmus is most definitely discussed. It is not glossed over. The only thing is that it is explained that R Yaakov Emden was mistaken and that R Yonasan Eibishitz was not a Shabtai Zvi follower. They do not give any qualifications or mention that RYE had many Shabtai Zvi followers around him, among his students and even his son Wolf. Indeed, the Pnei Yehoshua denounced R. Eybeschutz's amulets before R. Emden. You can hear a shiur of R' Leiman's in which he discusses the topic, and you can hear the grumbling and protests from the audience. And toward the end, he casually says something like, "And not that this should matter, but his father, wife, brother, and son were all open Sabatteans." The sounds from the audience stop abruptly. You can hear the uncomfortable silence. And R' Leiman chuckles and says, "Made you think there for a second, eh?" S. Leiman has a lecture which he gave in the white shul but it was not as you described. Can you source the lecture you are referring to? I have read pretty much anything Dr Leiman has ever written on this subject and listened to many of his lecture and I have never heard of anything of the sort. (I do recall him debunking R' Emden's claim regarding R' Eibeshitzs' wife grave.). Would appreciate you pointing me in the direction of this lecture. "his father, wife, brother, and son were all open Sabatteans." Father? The Sabbateans ran his father out of Amsterdam! What's meant here is R. Eibeschüts's father, who was rabbi of Eibeschüts, Checkia. I don't know if the information is true, though. But it was R. Emden's father, the Chacham Zevi, that was ousted of Amsterdam because of Sabbateans. Evolution is also “discussed” in the Charedi world. That’s not what we’re talking about. Why in your view is evolution only "discussed" in the chareidi world and not just plain discussed- sans quotation marks? I hope you see the narrow-mindedness in your assumption that no intelligent conversation can ever have taken place about anything scientific in the chareidi world. It's very sad how uninformed and deluded some folks can be. I've never had a discussion about evolution with a Charedi in which the Charedi did not have a preformed conclusion. Such discussions about science are a complete waste of time. "Ah, of course- how very stupid of me! Because many of the chareidi discussions about evolution end up with a different conclusion than David Ohsie's, which obviously disqualifies them from even meriting the status of true "discussion"! I don't know what had gotten into me; I'm just so arrogant and small-minded today"
There is evidently a misunderstanding here. I don't think that anyone, including RNS, is claiming that charedim don't know about the Emden-Eibeshitz controversy. But in the yeshivah world there is no serious discussion in terms of questioning and analyzing the evidence as to who was correct. It's just taken as a given that Rav Yonasan Eibeshitz couldn't possibly have been a Sabbatean, because he was a Gadol b'Torah. "But in the yeshiva world..." "its just taken as a given...."
As I replied to Yonah above, you are simply incorrect about that. Tell me something please- are/were you part of the yeshiva/chareidi world? If not, I dont see how you can make all these preposterous assumptions (it's not as if chareidi discussions have a considerable presence on the internet)- and if you are/were part of the chareidi world, then i presume you know very well that you were incorrect. "He was clearly uncomfortable with the question. After all, either Rav Yaakov Emden was badly wrong, or Rav Yonasan Eybeshutz was an apikores!" This is why R Slifkin views the discussion as "not suitable for discussion" in the charedi world. But this is clearly incorrect in the experience of the american charedim. As R Slifkin himself notes from R Wein in the comments, the charedi world has quite clearly chosen the first of the two options in the above quote: R Emden was clearly wrong. Again, one may disagree with the charedi opinion, but "not suitable for discussion"? Hardly. Also, I am curious what you think of the question I posed in my first comment. Do you think an American MO high school kid is more likely to be familiar with the Emden/Eibeshitz machlokes than a an American charedi high school kid? "Do you think an American MO high school kid is more likely to be familiar with the Emden/Eibeshitz machlokes than a an American charedi high school kid? " Hahahaha. The American MO high school kid has of course never heard of either Rav Yaakov Emden or Rav Yonasan Eibeshetz. "Hahahaha. The American MO high school kid has of course never heard of either Rav Yaakov Emden or Rav Yonasan Eibeshetz." I would agree with that, but without generalizing it across the board in the way you did. That statement of yours is paralleling that of RNS that the Emden-Eibeshutz dilemma is not discussed in chareidi circles, which you seem to be strongly in disagreement with. If we follow the trend of generalizing that you and RNS seem to be doing, then it seems that it would behoove each of you to rephrase your statements as "has a greater tendency not to be discussed in the chareidi world/MO high school". Just like some yeshivos will discuss the Eden-Eibeshutz saga without limitations while others (whether it's the majority or not) try to shy away from it, MO schools will likely not spend their time teaching their students about those two rabbis, while some very well may. I myself am from a MO orthodox background and I don't think I heard of either of those Rabbis when I was in my teenage years, and that's likely because learning about the ins and outs of all the gedolim or their works was not a priority on the school agenda, and the MO schools likely put more emphasis on other matters that the general chareidi system likely doesn't place priority on. Each school of thought (MO or chareidi), in general, has it's own individual agenda, with some few exceptions, and whether one hears about certain issues in their school institutions will depend on that agenda. Would the Emden-Eibeshutz be unequivocally discussed at length to the same degree in chareidi vs. MO schools? i.e. If the Emden-Eibeshutz controversy would be raised in either of those institutions, disregarding what the general yeshivah or MO high school does, which institution would more likely experience a greater sense of discomfort having that conversation? It would be interesting to extend the question to: are there certain controversial topics, whether they are part of the curriculum or not, that would render a MO high school teacher more discomfort than a chareidi high school teacher to have in his classroom if they were to come up? This was a well thought out response. However, you make a mistake in comparing my generalization to Slifkin's. Yes they are both generalizations, but his generalization is largely wrong, while mine is right for probably 98% (or more) of American MO high school students. "Would the Emden-Eibeshutz be unequivocally discussed at length to the same degree in chareidi vs. MO schools?" "his generalization is largely wrong, while mine is right for probably 98%"
I'm sorry. If you really meant that my response was well though out (thanks by the way for the compliment! ), please provide something to back your statistics up. The argument of "his is wrong, mine is right" is not the type of tactic that lends significance to a forum of people trying to have an intellectual dialogue. And let's say you're right. Let's say that the statistics somehow prove that the issue does indeed come up in that eloquently-stated "probably 2% (or less)" of MO schools. It's not a representative number. The issue doesn't come up that much in MO schools, as I previously stated, because we don't place our emphasis on Rabbi Yonatan Eibeshutz and Yakov Emden. Our kids don't come home with (let's not generalize) more to say about the Steipler than they do about Yiftach or Devorah. It's just not in the curriculum, and there is no reason for the controversy to come up, hence the lower percentage. But because these, and other, gedolim are stressed in yeshivos then there is a higher likelihood for the controversy to come up. I think you understood that based on your response, but that isn't grounds to say "the controversy is only significant if you already know who the Rabbanim are". The controversy may be more emotional and close-to-home, but I don't see how it would be more significant, unless you are insinuating that those rabbanim and their works are only significant for yeshivish folk? I am not quite too sure my concluding question was that futile. I was asking a hypothetical question, so there's no need to point out that "the controversy is not discussed at all". The point of the question, which I'm hoping you'd not sidestep, is which institution, in your humble opinion, would have greater discomfort and difficulty in addressing the matter thoughtfully and not be embarrassed to go into it at length? In other words, does one institution have a greater chance of bias in learning about the controversy objectively and at length in the classroom? Does one institution have greater odds of purposefully hiding the controversy from their talmidim? As an aside, in your comment you say things like "you make a mistake", "his is wrong... mine is right", "your question... is futile", "it's pointless". I apologize if my initial comment somehow gave off those vibes, but I assure you I never intended to. Please try to keep the same atmosphere. "but his generalization is largely wrong"
I guess you missed the comment below from 3OH3! One person's experience doesn't mean you're not "largely wrong". ! "please provide something to back your statistics up." You're kidding right? you went to MO schools and are not fully aware that what I wrote is true? Come on, just be honest about it. "which institution, in your humble opinion, would have greater discomfort and difficulty in addressing the matter thoughtfully and not be embarrassed to go into it at length?" We both know the answer is the MO school will not be embarrassed and the Charedi school will. Mazal tov. But that doesn't mean it's shoved under the rug in the Charedi school. But again, the question is moot, because no MO school would ever care enough to address it. So my conclusion: Charedi schools are more likely to hide info they are uncomfortable with, and MO schools are more likely to breed amei haaretz who are don't care about torah umitzvos. Would you agree with that conclusion? "You're kidding right? you went to MO schools and are not fully aware that what I wrote is true? Come on, just be honest about it." Fine I'll be fully honest, if you so desire. I am not convinced that the percentage of MO high schools that don't include Rabbis Emden and Eibeshutz in their curriculum is anywhere near the percentage of chareidi institution that shy away from discussing the Emden-Eibeshutz dilemma maturely. So unless you have some level of support to your statement, aside from you and a few others insisting on this blog that it is the case, then it's not a very wise comment to make in a forum that is aiming to enjoy dialogue on an intellectual level. "We both know the answer is the MO school will not be embarrassed and the Charedi school will. Mazal tov. But that doesn't mean it's shoved under the rug in the Charedi school." Why do you think the Charade school should feel embarrassed about having the discussion? What is the basis for that embarrassment? "my conclusion: Charedi schools are more likely to hide info they are uncomfortable with, and MO schools are more likely to breed amei haaretz who are don't care about torah umitzvos. Would you agree with that conclusion?" There a number of sensible ways to answer that, assuming I understand what that comment even means, but I think there's a preamble that warrants expression here. Not too sure if you get my drift, but I didn't come on this forum to blow off steam or denigrate other sects of Judaism to childishly lend superiority to my own. I am happy to have an adult conversation about the issues brought forth and I am hoping you'd feel the same. In your own words: "Until then, shtika kehodaa..."
I went to mainstream Charedi yeshivos (not to give myself away, I went to one of these: Torah Temima, Torah Vadaas, Mir, Chaim Berlin, Kaminetz, The Cheder, Tiferes Elimelech) both for elementary and throughout the rest of my school education (I need not list the HS, BM et al as you ought to surmise by my aforementioned list how/who I label “Charedi”). That being said, contrary to a number of the commentators here I completely echo the observation that understanding and analysis of both sides of the Eybeshutz-Emden controversy has not the slightest place of discourse in yeshivos. Throughout my years in yeshiva, all I knew of the controversy [from my rebbeim] is that there was some controversy, RYEyb was a gadol, RYEmd was also, but the former was for some reason accused -wrongly- of being a Sabbatean. Anything more comprehensive never had a place for discussion for the simple reason (which I realized already late in HS) that the average -prob even above avg. rebbi- himself doesn’t understand and isn’t familiar with its niceties. Furthermore, my friends and peers from other mainstream yeshivos were likewise clueless to the above. Being still entrenched in the North American Charedi world I still strongly believe that nothing changed. Ya, there’s talk of the controversy but that’s not the kind of “talk” we mean here. “How do you know?”, you’ll ask me. Very simple. See above: I’m “still entrenched in the North American Charedi world” and regularly converse with instructors, educators and “recognized speakers” and I would bet “biglty” that they don’t know anything of the details of the controversy. I don’t mean to be negative or condescending or taking the “holier than thou” road, they simply don’t know much about Jewish history. Never mind, I’ll stop here; I can go for days. Anyway, that’s my experience and, again, I’d bet bigly that it’s the reality in the Charedi world. "Ya, there’s talk of the controversy but that’s not the kind of “talk” we mean here." "Right. Here when we say "talk" we mean coming to a conclusion that the Gedolei Acharonim weren't as big as we thought. (עפ"ל)"
Yes, when Slifkin or Ohsie say "discuss" they mean come to their conclusions that denigrate Gedolei acharonim. Hahahaha. "Open discussion", what a joke. Actually, it's just the opposite. When you say "discussion," you mean one that must necessarily conclude with things that are consistent with charedi attitudes. Evolution is false, Rav Eybeschutz was not a Sabbatean (as that would be "denigrating Gedolei Acharonim." When we say "discussion," we mean evaluating the evidence without a predetermined conclusion. R. Slifkin, I don't think R. Eibeschüts would have been considered a "Gadol Acharonim" had R. Emden had the last word on the matter. Who thinks in our days that R. Hanau was a great grammarian who cannot be denigrated? There are lots of rabbis of the past whose name isn't so untouchable. And I think this means we can ask ourselves how R. Eibeschüts got there despite the serious case agains him, since his influence on contemporary jewish thought and halakha is mild at most, and it all comes from works which were mainly printed posthumously. I suspect this has much more to do with those who advocated him or were perceived as such (and especially the Gaon from Vilna). But it also means this is not such a sensitive matter for Chareidim, because after all, those works are not Sabbateans in essence, and have been vouched for by the archi-Gadol of all times. And then even if he really was a Sabbatean, wich most chareidim don't even know what it really consists of, it doesn't really matter. After all, the Rambam was a philosopher and rationalist, and we can still learn his works (it is also believed the Gaon vouched for him, so I guess it's all right)! You mean you guys have discussions WITHOUT predetermined conclusions? Or is it possible that your predetermined conclusions are just better disguised (from yourselves as well as from others)? Hameivin yavin. v'ha'eino meivin, (sigh) lo yavin. "You mean you guys have discussions WITHOUT predetermined conclusions?" Exactly. Proof: I started out rejecting evolution, then I changed my mind. With the Emden/Eybeshutz dispute, you yourself said that it would be "denigrating gedolei acharonim" to say that R. Eybeschutz was a Sabbatean. Hence there is a foregone conclusion. No, I changed my mind about evolution back when I was super-charedi. Lol, that's actually very funny! In my early books, I wrote about how evolution was false, why charedim shouldn't go to the army, and why we should follow Daas Torah. Lema'an Achai is honored and privileged to have Rabbi Dunner serving as a member of its American Board of Directors. We wish him amazing success in this and all of hie endeavors on behalf of the Jewish world. It doesn't bother you that Rabbi Dunner makes up facts in his book? He does so to make the episodes more exciting, but ordinary readers will read his book as fact when much of it (quotes, the thoughts and motivations of his characters, etc.) is historical fiction. Correct. But It is an entertaining read, and is doing a great job in popularizing interest in Jewish history. Also - he’s not up to date in his secondary literature - eg no mention of Michal Allon’s book with much research on the Baal Shem of London. But rabbi Dunner is a great lecturer - see him on YouTube! Making up dialogue is a common affliction - another example is the late Yehudah Avner’s bestseller on Israel Prime Ministers - read his Introduction carefully. All the PM’sspeak as though they come from Manchester! If you want a riveting example of 'popular' Jewish history look no further than Simon Schama. I cannot discuss statistics but my MO kids certainly had heard of the controversy while in high school if not before. You are suggesting that your MO kids heard of the Emden/Eibeshetz controversy in grade school? Eye roll. "it didn't matter, because it was secret!" Just a quickie typo fix: "Benveniste"
I presume you are talking about Rabbi Aviner's from 6 years ago. Am I right? No, I do not believe the average MO high school teacher would have alarm bells going off if one of his students brought that up. The first thought that would come, at least to my mind, is not "how am I going to preserve my students' reverence of this rabbi" but would rather get to the root of the matter in relation to women's rights, which MO on the most part tends to support. IMHO 2 things are missing from this whole discussion. 1. While we're speculating in the dark, RDNS has yet to finally clarify the context of his experience. Was he, or had he been, asking certain pointed questions that made the RY uncomfortable, or not? 2. This discussion shouldn't zero in onto the E/E controversy, but on *all* historic controversies. How do MO/UO etc. schools and families deal with the controversy over the rise of Chassidus, Moreh Nevuchim, & other lesser ones (such as, my goodness, some recent ones)? I'd think that the E/E controversy is dealt in the same way as the rest of them are. I don't know if R' Yonatan was a 'card carrying' Sabatean, but he appears, according to material in the Leiner article, to have been a fraud. He gave various incompatible excuses for his kamei'a texts ranging from bad eyesight to bad copies.The selling of amulets is also a problematic practice. If R' Yonatan was not, himself, a follower of Shabtai Tzvi - he was too clever, it seems, to fall for that faker, he appears to have been surrounded by them. He also used similar kabbalistic material for fame and profit. Of course, there were also enormous differences. R' Yonatan was a major torah scholar, while Shabtai was a megalomaniac. In the end, we are justified in studying the former's peirush on the Tur for its content, according to the Rambam's concept of accepting truth from whatever source. I also second 3OH3's comment about the nature of any mention of the Emden-Eyebeshitz controversy in traditional yeshiva circles. I have a similar background and was told the same approach to that issue. This in turn harks back to the "Making of a Godol" controversy. Particular astonishing is the account of how Rabbi Chaim Beneviste, one of the outstanding halachists of his era, was initially skeptical of Shabbtai Tzvi, had a fierce confrontation with him, and then was converted to being a staunch believer! Never new this. quite astonishing but still a bit misleading imo. ו בהתנגדותם נאלצו להימלט מהעיר. שבתי צבי הדיח את רבי אהרן לפפה מהרבנות ומינה את רבי חיים לרב הראשי היחיד בעיר. תקופת תמיכתו של רבי חיים בשבתי צבי נמשכה כתשעה חודשים עד להתאסלמותו של שבתי צבי, ולאחר מכן עמד רבי חיים בראש הרבנים שלחמו במאמיניו. הפוסקים רואים את תשעת החודשים של תמיכתו כטועה בהילכתא למשיחא, וכיוון שחזר בו מטעותו ועשה תשובה, טעותו נסלחת, ולא נפגם מעמדו כרב ופוסק. The claim in wiki is non sourced. what is your source that Rabbi Chaim Beneviste,became a believer.? From wiki, it seems like thugs forced him to stop his opposition to shabsai tzvi, rather than he actually believed his claims.